* The dairy sector contributes $7.8 billion (3.5%) to New Zealand’s total GDP. * This comprises dairy farming ($5.96 billion) and dairy processing ($1.88 billion). * Despite the recent drop in global dairy prices, dairy remains New Zealand’s largest goods export sector, at $13.6 billion in the year to March 2016. Over the past five years, average export revenue has been $14.4 billion. * It accounts for more than one in four goods export dollars coming into New Zealand (29% in 2016, down from a high of 35% in 2014). * Dairy export growth has averaged 7.2% per year over the past 26 years. * The dairy sector exports twice as much as the meat sector, almost four times as much as the wood and wood products sector and nine times as much as the wine sector. It generates almost four times as much export revenue as export education. * The dairy sector employs over 40,000 workers, with 27,500 on farm and a further 13,000 in dairy processing. * Dairy employment has grown more than twice as fast as total employment, at an average of 3.7% per year since 2000. * It has created jobs at a faster rate than the rest of the economy in all but 5 territorial authorities across New Zealand. * The sector paid $2.4 billion in wages to dairy farming and processing workers in 2016. * The dairy farming sector has the second highest average wage ($46,640) in the wider farming sector, behind deer farming ($48,320). * The average dairy processing wage is $72,910, well above all other forms of food product manufacturing. The average food manufacturing wage is $58,200. * Dairy provides over 1 in 5 jobs in three territorial authority economies (Waimate, Otorohanga, Southland); and over 1 in 10 in a further eight (Matamata-Piako, South Taranaki, Hauraki, Waipa, South Waikato, Clutha and Kaipara). * The dairy sector accounts for 14.8% of Southland’s economy, 11.5% of the West Coast economy, 10.9% of the Waikato economy, 8.0% of Taranaki’s economy and 6.0% of Northland’s economy. * Dairy farming supports a range of supplying industries: in 2016 farmers spent $711 million on fertilisers and agro chemicals, $393 million on forage crops and bought over $190 million of agricultural equipment. * Farmers also spent $914 million on agricultural services, $432 million on financial services and $197 million on accounting and tax services. * The dairy farming sector provides around $400 million of intermediates to the meat processing sector. * As well as taking farmers’ raw milk, the dairy processing sector also spends significant amounts on packaging ($288 million in 2016), hired equipment ($199 million) and plastics ($174 million). * DairyNZ estimates that farmers have spent over $1 billion in recent years on environmental management systems such as effluent systems, riparian plating and retiring sensitive land, or about $90,000 per dairy farm. * The processing sector has also made substantial capital investments in the past four years, adding over $2 billion to New Zealand’s capital stock. * If all global dairy tariffs were eliminated, and New Zealand’s milk production is held constant, the value of New Zealand’s dairy exports would increase by $1.3 billion, generating a $1.03 billion increase in New Zealand’s nominal GDP. * In a separate modelling scenario, if global dairy tariffs increased from their average applied rate to their average bound rate, New Zealand’s dairy exports would fall by $2.3 billion, leading to a $1.66 billion fall in New Zealand’s nominal GDP. * This provides an indication of the value of historical dairy tariff reductions due to multilateral, plurilateral and bilateral trade negotiations, or the benefits of preventing any backsliding towards trade protectionism. Those last two points show the value of free trade and the cost of protection. This report doesn’t mention on-farm investment nor does it note the social impact of dairying. There were four houses on our farm and our two immediate neighbours’ before we converted to dairying. There are now 15 and the 16th will be built early next year. Some of the people in the houses are young travellers. Others are a bit older with families. All contribute to the economic and social fabric of the district. The environmental impact of dairying isn’t mentioned in the report either. There is no doubt intensification has had a detrimental affect on water quality and the vast majority of farmers, with the encouragement from DairyNZ, Federated Farmers, regional councils, and irrigation and dairy companies are now doing everything they can to remedy that. Water quality didn’t deteriorate overnight and it will take time to improve it. A few poor performers are still letting everyone down but it is unfair to tar the whole industry with their dirty brush. 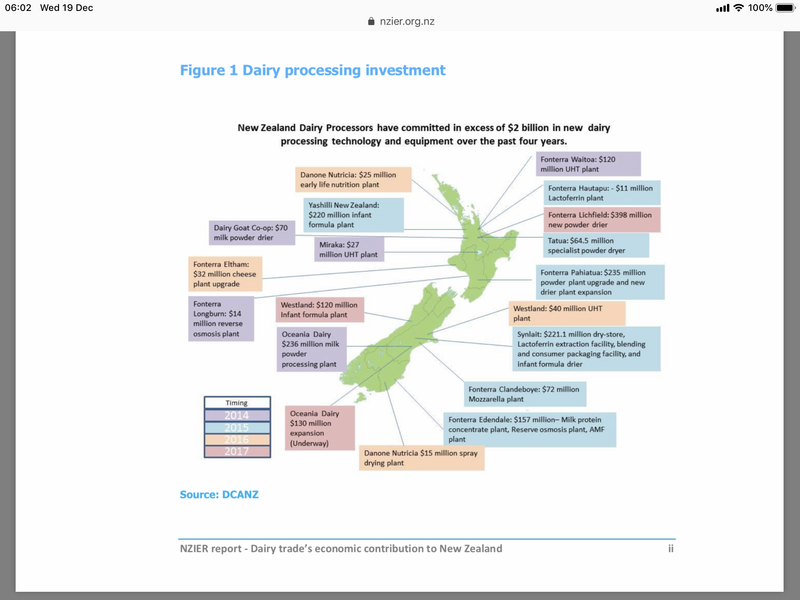 The NZIER report shows the positive impact dairy makes and it is that $7.8 billion contribution to GDP that helps pay for the first world services and infrastructure we need. Environmental concerns can not be ignored but any action taken to solve problems must take into account the economic and social impact or it will sabotage the government’s wellbeing goals and we will all pay the price of a much lower standard of living. In the August ANZ Business Outlook Survey headline business confidence dropped a further 5 points to a net 50% of respondents reporting they expect general business conditions to deteriorate in the year ahead. However, firms’ perceptions of their own prospects are a much better gauge of actual economic outcomes. This series stabilised at a net 4% expecting an improvement, well below the long-term average of +27%. By industry, manufacturers’ expectations dropped 11 points to become the least positive about their own activity (-4%), while retail and services improved somewhat. * A net 5% of firms are expecting to reduce investment, down 6 points. It is rare for this series to be negative. * Employment intentions fell 8 points to -6%. No sectors are positive. These two points are most concerning. Businesses reducing investment and with negative employment intentions will have a direct and negative impact on the economy. * Profit expectations were flat at -17%. Retail and manufacturing are the weakest sectors at -27% (up 1%pt) and -28% (down 12%pts) respectively. * Firms’ pricing intentions fell 2 points to +27%. They are strongest for construction but also lifted for retail. Inflation expectations were flat at 2.2%. * Residential construction intentions eased 3 points to +13%, while encouragingly, commercial construction intentions bounced 13 points to -4%. . . The economy is delicately placed. But it seems increasingly inevitable that wariness amongst firms will have real impacts, in the near term at least, as investment and employment decisions are deferred. . . The outlook isn’t all bad. But firms have real concerns about industrial relations policy, minimum wage hikes and costs more generally – and particularly about their ability to pass on higher costs and maintain profitability. Troubles in the construction sector appear to be starting to cause stresses in related firms. And exporting firms will be keeping a nervous eye on signs that global growth has peaked. . .
“Company tax rate cuts – accompanied by full capital expensing – would put a rocket under business investment and put an end to the doldrums. If focused at measures to boost productivity, the evidence shows that tax relief would flow through to workers in the form of higher wages.” . .
Tax reform would help and not just for businesses. The Government’s obsession with fuel taxes shows it doesn’t care about the cost of living for ordinary Kiwis, National’s Transport spokesperson Jami-Lee Ross says. “Now is the time for solutions to the cost of living, not new taxes. National is taking the initiative with a bill lodged today to repeal regional fuel taxes within three months. “Fuel prices are sitting at record levels across the country and are set to rise further because the Government is proposing three additional rounds of national fuel tax increases totalling an extra 12 cents a litre of fuel in new taxes. “In addition, there is an 11.5 cents a litre regional fuel tax in place in Auckland that will be rolled to other regions in a few short years. It adds to this Government’s sorry record of driving up costs for households and businesses and choking economic growth. . .
Added costs and uncertainty are a poisoning business confidence and this week’s announcement of a business council is no antidote. Free trade is vital to New Zealand, Horticulture NZ Mike Chapman says. New Zealand is a trading nation. We rely on export earnings from free trade for our financial prosperity. But free trade is a two way street – the countries involved open up their borders to allow free movement of goods and services on an equal basis. This includes property ownership. The pathway to premium export earnings is through innovation and having a point of difference. Access to the latest techniques and innovations is key to New Zealand remaining competitive and market leaders. The truth here is that to do that, New Zealand needs strong links with the international science community, companies involved in innovation, market leaders and companies with scale and market penetration. Many of those international companies have operations based in New Zealand. Equally, New Zealand also has operations based in their home countries. That involves property ownership. Here, I’m not talking about residential properties. – Trade accounts for $85 billion (43%) of New Zealand’s GDP. – Trade gives each household in New Zealand improved product choice worth $3.9 billion, or $2,300 per household. – A US study estimates that trade contributes about 30% to the average US household’s purchasing power. In New Zealand this would be far higher, given how trade reliant we are compared to the US. – More free trade agreements will increase New Zealand’s GDP by $18 billion and create 42,000 skilled and 20,000 low skilled jobs. Freeing up trade and keeping trade free are vital for New Zealand’s continued prosperity. Tightening up on any aspect of our free trade may have a ripple effect. As a country, we do not want to slip into economic decline. So Horticulture New Zealand’s plea to New Zealand’s new government is to keep the previous Government’s free trade agenda running. Foreign investment in New Zealand enhances our economic prosperity. – New Zealand’s prosperity depends on free trade – we can’t compete if, due to tariffs and other barriers, our goods and services are more expensive than those from other countries. Simply put, our goods and services will not be purchased. – Many overseas companies that have invested in New Zealand enhance our ability to be market leaders and innovate, provide many jobs, and contribute to our economic prosperity and ability to buy goods from around the world. – New Zealand’s companies need to invest in overseas countries to enhance our ability to compete for premium prices and keep ahead of innovations – it is a two way street. We can’t win the fight to open doors for our goods and services if we close our own. Successive Labour and National governments have agreed on the importance of free trade and worked to advance it. We’ll all lose if the new government attempts to return to the bad old days of fortress New Zealand. “The Government has an ambitious plan to improve water quality in our rivers and lakes that involves stronger direction to councils, tighter regulation and funding to support projects. Today we are announcing grants of $44m for 33 projects which, with Council and other contributions, will see $142m invested in over 100 lakes and rivers.” . .
A partnership approach to dealing with river and lake water quality offers the best prospect of making sustained progress on problems that were often decades in the making, Federated Farmers says. The Federation’s water spokesperson Chris Allen hailed the announcement today of an initial $44m in grants from the $100m Freshwater Improvement Fund, particularly as it will leverage a further $98 million of investment by councils, farmers, other land-owners and agencies. In total, 33 projects covering more than 100 lakes and rivers have won funding, including at Lakes Tarawera, Horowhenua and Wanaka and involving the Manawatu, Wairoa, Waimea and Selwyn Rivers. . .
Government funding for a nationwide project to better protect waterways, by measuring and managing nitrogen on cropping farms, has been welcomed by Horticulture New Zealand. Today Environment Minister Dr Nick Smith announced funding of $485,168 from the Freshwater Improvement Fund for a three-year project: Protecting our Groundwater – Measuring and Managing Diffuse Nutrient losses from Cropping Systems. 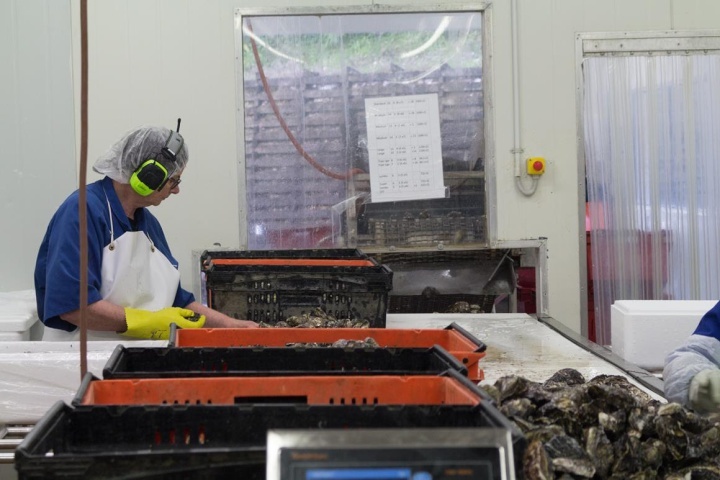 . .
Coromandel mussel and oyster farmers, along with industry, iwi, businesses and agencies came together today to celebrate the findings of a report which demonstrates the real economic and social value of aquaculture to the Thames-Coromandel and surrounding regions. Some of the key findings from “The Economic Contribution of Marine Farming in the Thames-Coromandel District,” written by the New Zealand Institute of Economic Research (NZIER) include: . .
(BusinessDesk) – Headwinds are building for New Zealand exports of beef, the country’s largest meat export, according to AgriHQ. The outlook for beef prices is weakening in the US, the largest market for New Zealand beef, after a United States Department of Agriculture report showed cattle numbers at a nine-year high as farmers rebuild their herds following heavy culling in 2014 and 2015, with most of the increase in beef cows rather than dairy cows. Elsewhere, Japan has temporarily lifted the tariff on frozen beef from New Zealand, rival exporter Australia has increased supplies, and a rise in the New Zealand dollar . .
(BusinessDesk) – CropLogic, the agricultural technology company which counts Powerhouse Ventures as a shareholder, will have its initial public offering underwritten to ensure it crosses the A$5 million threshold. Sydney-based Hunter Capital Advisors has been acting as a corporate adviser to CropLogic and has committed to ensuring its public listing succeeds, acting as an underwriter for the offer, CropLogic said in a statement yesterday. Christchurch-based CropLogic is offering 40 million shares at 20 Australian cents apiece to raise as much as A$8 million and listing on the ASX. Those funds will pay for market development, research and development, working capital, and to cover the cost of listing, which is a certainty with the underwrite. . .
For all its promise, synbio and lab-made food need to overcome a number of challenges and not everyone is convinced it will be the solution to the problems of conventional animal agriculture. This gives New Zealand at least a small window of respite while it assesses a potential road ahead without the farm. Like all agricultural innovations, crop protection products have evolved tremendously since their inception. From natural chemical elements, to plant and metal-based insecticides, to synthetic products, formulations have drastically changed for the better. Today’s products are more sustainable, targeted, efficient and environmentally-friendly than their predecessors. The first recorded use of an insecticide was about 4,500 years ago by the Sumarians, who used sulphur compounds to control insects and mites attacking their food sources. In the first century B.C., Romans made a compound from crushed olives, burnt sulphur and salt to control ants and weeds in their crops. In 800 A.D., the Chinese used arsenic mixed with water to control insects in their field crops and citrus orchards. Other pesticides, derived from natural sources such as pyrethrum from dried Chrysanthemum flowers and nicotine extract from tobacco plants, evolved over time. . . Farmers do cry over spilt milk. ExportNZ says all political parties should be supporting international trade. ExportNZ today released a report analysing the benefits to all New Zealanders from freely traded exports and imports. The Benefits of Trade shows that New Zealand’s export sector directly and indirectly accounts for nearly three quarters of a million jobs, and that exports bring in 43 percent of New Zealand’s GDP. “This is a massive chunk of our economy. Without exports we would literally be a third world economy,” said ExportNZ Executive Director Catherine Beard. “New Zealand exporters – manufacturers, primary producers and technology and services exporters – earn the foreign exchange that pays for all the good things we enjoy. Without a vibrant export sector, we would not be able to afford the infrastructure, health, education and welfare services that are the mark of a first world nation. Exports enable us to pay our way in the world. We can’t afford imports unless we successfully export. It’s not just luxury goods but basic requirements for first world living standards including health supplies, machinery and the food we can’t grow ourselves that we need to buy from other countries. The money to buy those goods come from our exports and the freer we are to trade the better off we all are. Catherine Beard said with the approach of the 2017 Election, it was important to hear from all political parties on how they would support trade and free trade agreements with other nations. “It’s time for all political parties that want a higher standard of living for Kiwis to get in behind New Zealand being a participant in high quality free trade agreements wherever in the world we can get them. Catherine Beard says in a world of increasing protectionism it is important for all political parties to be united behind an ambitious free trade agenda, because the benefits to New Zealand are overwhelmingly positive. GDP and almost three-quarters of a million jobs. lets them access a wider variety of products. to $3.9 billion, or around $2,300 per household, based on estimates from the literature. are compared to the US. boosting Kiwi households’ purchasing power by 2%. jobs and 20,000 low-skilled jobs. flow of technology are hugely important. capita GDP by over $1,000 by 2020.
and US$555 billion per year. come from a reduction in non-tariff barriers. Anyone old enough to remember what life was like in New Zealand before the trade liberalisation of the 1980s and 90s won’t want to go back there. Domestic goods were usually more expensive and of inferior quality to imports. Imported goods were in short supply and usually had inflated prices owing to tariffs. People didn’t travel as easily or often as they do now and when they did they returned laden down with goods which were not available or far more expensive here. Any policies which limit trading opportunities for exporters or hamper the ready access to imports will hurt us all, and the people who will be hardest hit will be the poor. With freer trade we all benefit and can even sell avocados to Mexico. Her question was intriguing to me. Not because it was unique, the exact opposite. Because it was so common. Almost without fail, when I get the chance to talk to producers about the desperate need to tell the story of agriculture, someone asks a similar, politically loaded question. But it’s a fair question, isn’t it? In this politically correct era, surely a blogger can still call a spade a spade? Because isn’t the reality that our enemies are easily identifiable? Isn’t agriculture really just at war with liberals? . . .
Trade Minister Todd McClay has welcomed the entry into force of the WTO Trade Facilitation Agreement (TFA) saying it is a big win for New Zealand exporters. “The TFA will benefit all New Zealand exporters and is particularly good for small and medium sized enterprises. The TFA reduces the cost, administration and time burden associated with getting products across borders and into the marketplace,” Mr McClay says. (BusinessDesk) – New Zealand’s economy would be hard hit if there is a retreat to protectionism in the global dairy sector, a report from the New Zealand Institute of Economic Research has found. “In the current global trading system, the tide of protectionism is rising. Brexit and the initial trade policy proclamations by Donald Trump both point to a challenging environment for further trade liberalisation, at least in the short term,” said NZIER in the report for the Dairy Companies Association of New Zealand. Against this backdrop there is an increasing risk that tariffs could be lifted rather than reduced, it added. . .
Bobby calf deaths more than halved after a big improvement in their transportation welfare last spring. A new report from the Ministry for Primary Industries showed the mortality rate went from 0.25 per cent in 2015 to 0.12 per cent last year. Last year 2255 calves were reported dead or condemned during the time they were collected for transport to their slaughter from 1,935,054 calves processed. The declining number of sheep in New Zealand and changes in weather patterns are driving more shearers to chase work around the globe. The national sheep flock is now about 27 million, a big drop from the 70m or so sheep that the country had in 1982. Jacob Moore from Marton is part of a group of about 60 young shearers who follow the summer seasons for work. Mr Moore said for shearers who were at the top of their game and established locally, there was full-time work and contractors tended to hold on to them for many seasons. NZ Wool Services CEO John Dawson reports 4600 bales on offer this week saw an 87 percent clearance with mostly positive results, with lambs wool increasing considerably. The weighted currency indicator is down 0.34 percent having a small but positive impact. More growers are continuing to hold back wool, further reducing volume which is restricting supply in some categories. Mr Dawson advises compared to the last South Island selection on 16 February; . .
(BusinessDesk) – A2 Milk Co’s chief executive and chair have sold down their stakes in the milk marketing firm, less than a week after reporting first-half profit more than tripled as demand for its A2 Platinum infant formula surged in its key Australia, New Zealand and China businesses. Chair David Hearn sold 1 million shares for about $2.5 million, or $2.48 a share, on Friday, while chief executive Geoffrey Babidge sold 900,000 shares for $2.2 million, or an average price of $2.49, yesterday. Hearn gained the shares by exercising 1 million of his 5 million options, for which he paid $630,000, with the sale to facilitate a property transaction in the UK to move his personal residence, according to documents published to the NZX. . . Farmers in drought-hit Northland battling with a shortage of stock feed are also experiencing the worst maize harvest in 30 years. .
Northland Regional Council is warning farmers to be careful with feed reserves and not get too excited about the recent rain. The council said the drought meant some farmers had already used up their extra supplementary feed, which was being saved for the autumn and winter months. Northland dairy farmer Even Sneath said it had been a terrible season for growing crops. . . Faced with record numbers of international visitors this summer, Ministry for Primary Industries biosecurity staff have intercepted risk goods ranging from the bizarre to the potentially devastating for New Zealand’s economy and environment. • A chilly bin of live spanner crabs from Thailand presented to officers at Wellington Airport. • Fruit fly larvae in mangos found at Auckland Airport inside a suitcase from Malaysia jammed full of plant produce and other food. . .
New Zealanders are being invited to invest money for honey in a revolutionary hive sharing initiative launching today. Whanganui-based Canaan Honey has launched a PledgeMe crowdsourcing campaign for investors looking to get a sweet return: a lifetime supply of honey. A launch party last night saw the season’s first harvest of honey with a 3kg bonus honey offered to the first 10 signups. Hive Share lets backers around New Zealand become beehive owners, without the fuss of having to look after the hive. . .